Have You Every Wondered What it Means To Be Holy? 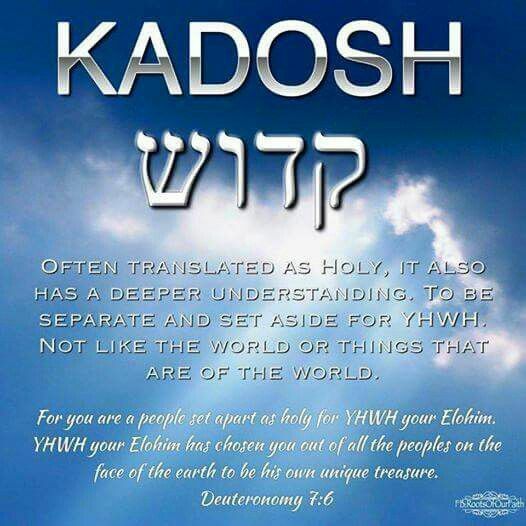 “For it is written,” a quote from the original Hebrew, holds the meaning of the word Holy. “Be Set Apart,” (Qadosh) is not an impossible suggestion, but a well defined instruction. Anyone with eyes to read or ears to hear can know exactly what our Creator meant when He told His people to be Set Apart (Qadosh). Leviticus chapter 11 follows the command to “be Holy,” with a detailed description of which animals Holy people eat. Here’s a fun song that makes the it easy to remember; https://www.youtube.com/watch?v=8v8nmgGD1ik. Leviticus, chapter 20 continues, adding warnings of what is most abhorrent to YHVH, sacrificing children to Molech and Unfaithfulness. Holy is not an elusive word, it is a dividing word. It puts a distinction between what is God’s and what is of the world. We set ourselves apart from what is common in the world by making a distinction between what God says and what the world says.